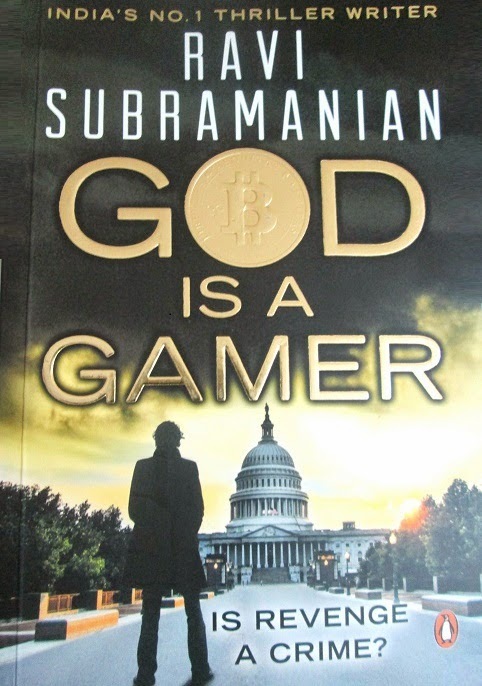 God is a Gamer is the latest book by author Ravi Subramanian. It is packed with a great plot, clearly etched out characters and an engaging writing style that makes the book literally unputdownable. The thing that first attracted me towards the book was its excellent over design with a silhouette of a man standing in front of a building, black background and golden fonts. It gave a brief idea as to what I can expect from the book and “God is a Gamer” did not let me down as it kept me captivated from the beginning to the end. The story begins from Washington DC where a close aide of the President is assassinated and a phishing scam rocks an international bank in India where customers lose money. An influential banker in India dies while the bank’s account is hacked and money is siphoned off from ATMs across New York. A new person changes the fortunes of a gaming company and nothing is as it seems as new facets of the story emerge all of a sudden. This book opens the world of Bitcoins or virtual money and online anonymity through TOR to the readers.The chapters are short and crisp and you have no idea how time flies while you read the book. God is a Gamer is the world’s first thriller on Bitcoin and the author has left no stone unturned with his extensive research to keep his facts and information clear. Special mention definitely has to be made to the author’s writing style which is simple and easy to understand. Even banking terms, financials and political talk are clearly explained in a manner understandable to all. He has woven the story so well that you feel like reading the book in one go to find out what happens in the end. I read this book in 2 days flat as it kept me hooked to it. I was so excited to read what happens next that I sometimes had to skip a few pages and then come back to continue again. The story ends with a stunning climax and you are simply bowled over by it. Author Ravi Subramanian has now found a place in my favourite author’s list and his other books “If God was a Banker”, “Devil in Pinstripes”, “The Incredible Banker”, “The Bankster” and “Bankerupt” are in my radar now and would surely be picked up for reading. God is a Gamer is a book you should not miss. It is racy, tight, smart and intelligent and you would not get bored even for a single second. The book is reasonably priced at Rs. 299 and you can also get it at a much discounted price at Flipkart, Amazon and other online retail portals. Ravi Subramanian is an alumnus of IIM Bangalore and has spent two decades working in various global banks in India. His stories are often set against the backdrop of financial services industry and have won several awards. He currently lives in Mumbai with his wife and daughter.